Folderol Friday is just like Mish-Mash Monday, only on Friday. I know this is my third post in under a week, so please don't faint or have a heart attack! Today's topics are sparklies, spring, seeds, and fuzzy friends. The tree, adorned with sparkly strands, hanging from the ceiling at the Chicago Flower & Garden Show reminded me of some cool sparkly strands hanging from the ceiling in a hallway at the Detroit Institute of Arts. See? 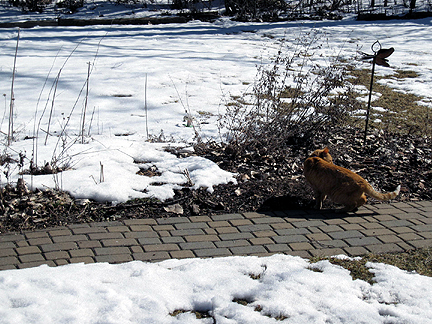 Around March 5, we still had lots of snow, but it was sunny and getting warmer. 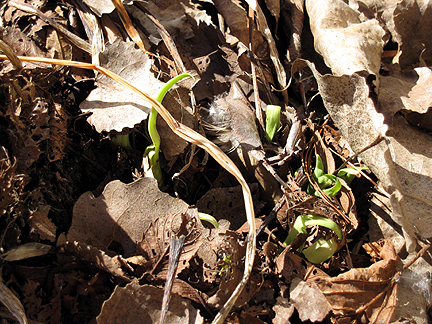 The very first signs of green in my garden (this year on March 5) aren't aconites, snow drops, crocuses, or hellebores, but tiger lilies. 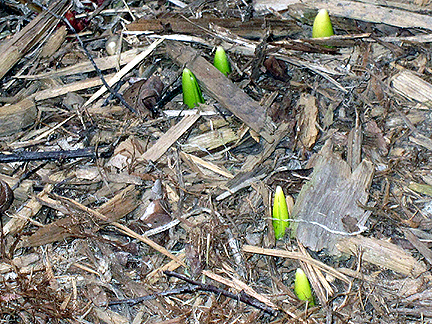 On March 9, I saw the hyacinths, the first bulbs to come up in my garden. 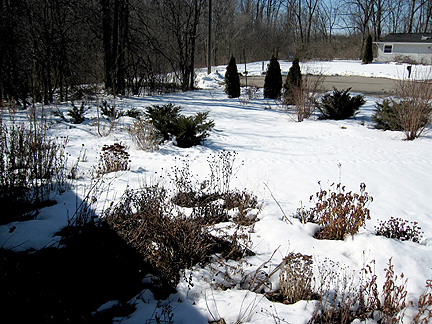 By March 11, all the snow had melted. Still, I admit spring is the worst time to have blogging friends in warmer climates. It makes weather that is natural and normal in Michigan seem stunted, lagging, and like it should be riding the short bus. 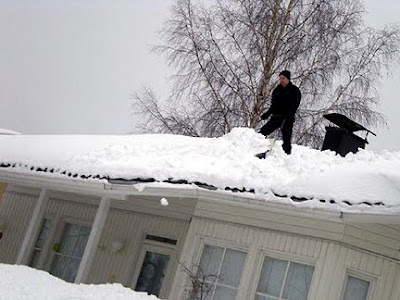 ...and here's her hubby Matti shoveling their roof! That makes me feel a lot better, LOL! Here, it's been really warm, in the 60s, but it's supposed to cool down and possibly snow next week. Which is entirely normal because it is still March and it is still Michigan. A few years ago, I bought a little stick of a witch hazel for $8 at a fund raiser. Now, even $8 seemed like kind of a lot, all things considered, but it was for a good cause and I'd been wanting a witch hazel. It hasn't grown much over the years and is still more or less a stick. I wasn't expecting it to bloom this year, either, until Garden Girl showed her similarly sized witch hazel blooming, which forced me to go out and look at mine. Jackpot! She is blooming! The flowers are only about half an inch in diameter. I'm not even sure what kind of witch hazel this is. It was labeled Hamamelis vernalis in handwriting as I watched, and only after I asked, by two amusing older gentleman who were arguing with one another in hushed tones about the species and each other's competency. They finally agreed to "just mark it Hamamelis vernalis and be done with it." I had wanted the witch hazel native in Michigan, Hamamelis virginiana, and even called ahead of time to ask which species would be available. I was assured that, yes yes there now, that is what they had. At the time, I therefore thought I in fact did have a virginiana and that the confused gentlemen just mislabeled it vernalis. But now that it's blooming, I can tell I have neither, as both virginiana and vernalis have yellow flowers. I suspect I have a hybrid, probably Hamamelis x intermedia 'Diane'. I still like it a lot, but, well, um, oh never mind. James was excited to check out dried plants in the cat garden on March 5. 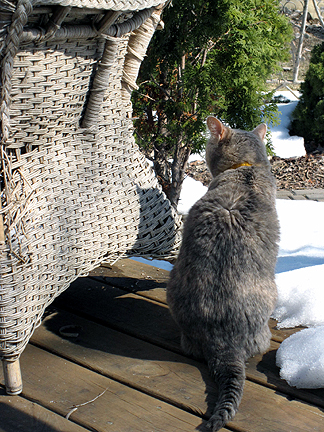 Fiona was pleased to be able to sit on wood, as opposed to snow. 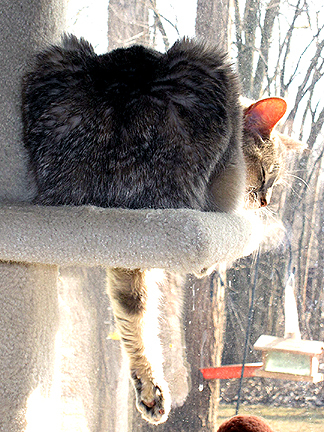 (She loves that old chair, which is her scratching post.) She had the cutest pose on the top of the chair, but by the time lumbering hooman came back with the camera, she had moved on. Speaking of which, here's a rare instance of Fiona holding a pose until I got the camera! 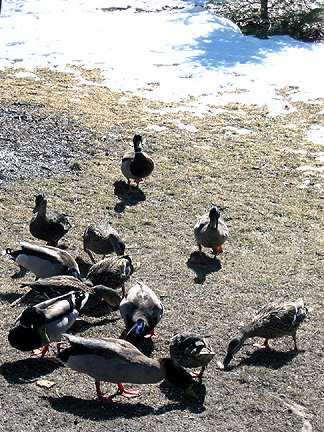 I get lots of ducks at the feeders. They're nature's vacuum cleaners. Also, the groundhog is awake from hibernation. This photo couldn't be more boring, but it shows a rare phenomenon here at Garden Faerie's Musings, one that hasn't happened in over 6 years: indoor seed starting. 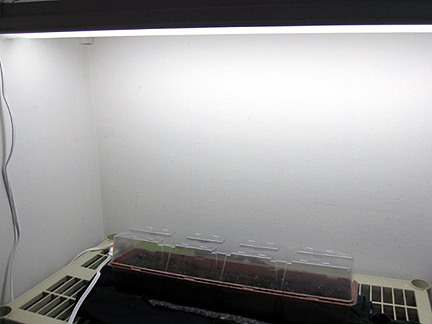 I've been happy winter sowing and had no intention of setting up the grow lights or clearing out room in my closet for seed flats (my house is small and I have very few open spaces elsewhere). A friend once grew Mary Jane in the closet and so I have vague fears about cops knocking on my door thinking I'm growing pot... when it fact it's cactuses! Yes, I couldn't resist a packet of mixed cactus seeds. I did try two with winter-sowing, but broke down and sowed the rest in a warm (actually I keep my house embarrassingly cool) bright environment. 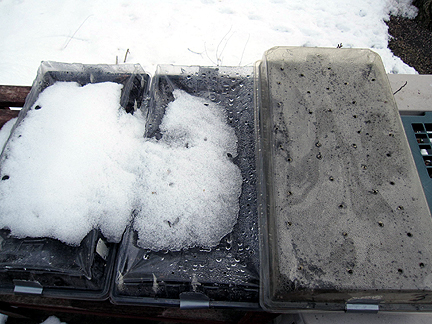 Winter-sowing tip: If ice or snow turns heavy enough to bow down the lids of winter-sown flats, remove the snow. Otherwise, let it melt on its own. Have a great weekend, everyone! I'm having dinner at my friend Pete's this evening and tomorrow my friend Amy and I are off to the Growing Great Gardens conference in Taylor. *As an Arrogant Worms fan, I always parse this as Russell's Shorts, but that's just me! It was so hot in my class this morning that the snow pictures actually look refreshing. They say we'll get snow this weekend but I'll believe it when I see it. Still, March in the Midwest... anything goes! 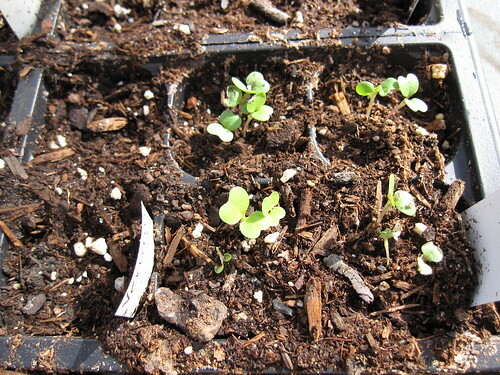 Hi Monica - I potted up a few of those bunnytail seeds you sent me and they've started to sprout!!! Wowser! Lots going on in Michigan. Those photos from your friend in Finland can really make a northerner gal not feel so bad. I agree with you on your witch hazel. You got a better deal. I have the virginiana and it is supposed to bloom in the fall but in the 3 years it's been here it hasn't, but even if it did I'd probably not notice it as it is not a big deal. The vernalis for me blooms in January and is fragrant but you have to get close to it to smell the tiny flowers. I like Diane a bit more though mine hasn't done well:( $8 was a bargain either way. Good luck on your cactuses. Took me a while to figure out what Mary Jane was. Truly. My first sign of spring greenery was strawberries (actually left over foliage from last fall but I don't care, I'm counting it anyway). I do have some bulb foliage showing now but it will be weeks before they bloom. Toby was outside briefly the first part of the week. The weather was beautiful and he was rolling around and enjoying the sun. I finally had to trick him to catch him and bring him inside. He is as sick of the winter weather as I am. Oh Ihr habt noch Schnee! Wir Gott sei Dank nun endlich nicht mehr und er darf ruhig weg bleiben. Deine Freundin in Finnland hat ja noch richtig viel von dem weißen Zeug. Sehr eindrucksvoll das Foto von dem Detroit Institute of Arts. Gefällt mir sehr gut. PS: Hier ist endlich Frühling !!! Hi Monica....love the witch hazel, pretty colour. The rabbits ate mine.....grrrrrr. My goodness, you're becoming a daily writer! What is the world coming to? Such a pleasure to see your awesome posts more regularly! On the other hand, I have blogging friends in Sweden and their summers look like an eternal spring. Here, summer can mean suffering. It cooled off here for the first day of spring. Any other year and I would have thought 38 F was a heat wave. This year it feels cool after temps hovered in the 50s so long, so early. Ah well, back to normal. We don't want to get spoiled, do we? Monica, I like this meme~~I might have to use it~sometimes there's just more to share then others! 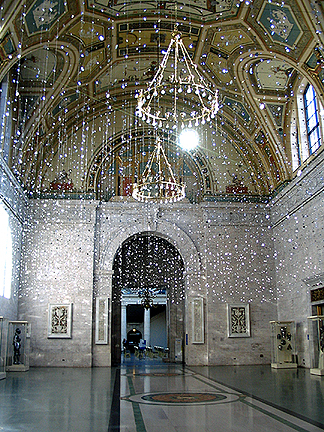 I do love the sparkly tree thingy in the art museum~Lately sparkly things are attractive...Must be my fading eye sight! 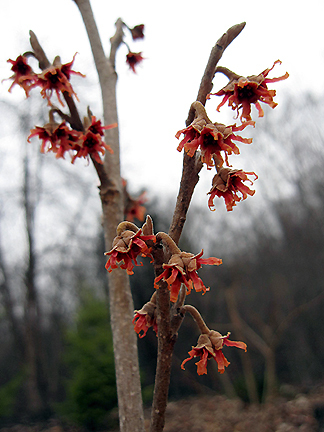 I have three different witch hazels and though I like H virginiana.... There's lots going on in my garden when it blooms. I appreciate the winter bloom on both H vernalis (mine is very fragrant) and Diane when there is nothing going on in the garden! I hope the snow is fleeting and snow zooms your way pronto! So, a little snow would be most welcome. Funny story with your witch hazel. I can understand your frustration with it still being that small. Be patient, spring will come also to Michigan:) It will just take a little longer! Oh dear, Monica, I completely forgot to move my winter sowing containers into the shade before we left. Hopefully, it didn't get that warm while we were gone. I still don't have anything sprouting, but maybe I'll have a surprise or two when I get home. Love the witch hazel! I'm too cheap to spring for a mature specimen, but I think you got a great deal. Oh, re your comment about the buckthorn at the Chicago show, I thought what they were showing looked an awful lot like what we call mulberry trees. Now, that's something we have a lot of, and they're a pain to cut down, too. Your witch hazel is cute! Did the flowers have any fragrance? I still want a red one, and a spring bloomer like yours. I have the virginiana and it blooms in fall for me (it's little more than a stick too, @ 3 feet tall). INDOOR seeds?! You go girl! It will be interesting to see if the wintersown cacti sprout too...good luck! 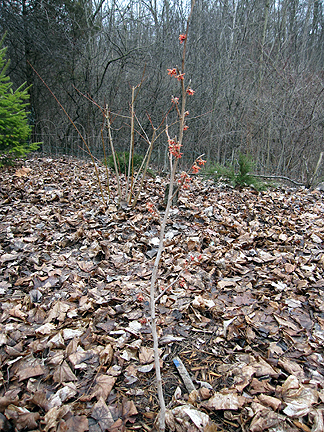 I planted witch hazel for the first time this year. It did look like a stick. Now I am inspired to go out at look at it. It will probably look like a stick still. I like those dangly lights Monica - they are most quietly elegant. Glad that your witch hazel is flowering - shame that it is not what you anticipated I am sure that you will still enjoy. Your friend in Finland must be over the moon to see the back of winter - now that is serious snow!